Our Shea Butter Facial Soap Sampler includes three slices of our incredible handmade Shea Butter Facial Bars: Lavender, Grapefruit Bergamot and our new Mediterranean Fig. 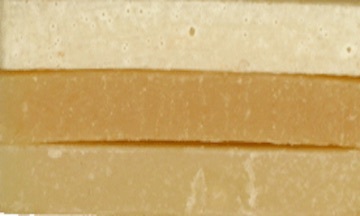 Each soap slice is packaged individually in clear plastic bags and labeled so you'll know 'which is which'. The bars are then wrapped together in a colorful strip of fabric and enclosed again with a decorative cellophane bag with gold foil label.